Levi Nadlersmith is a cross-country skier from Boissevain, Manitoba. Growing up in southwestern Manitoba, Levi says he began skiing at a young age, skiing constantly in the provincial park near his home. Levi’s family is heavily involved in the sport, and he says he was hooked on the sport after his grandfather brought him to his first competition. Skiing competitively since age eight, Levi has become one of the nation’s top young skiers. In December of 2015, Levi competed at the Youth Olympic Games qualifier, hoping to clinch the only men’s spot available. The 10km skate race was one of his best races ever, and he notes, “I executed the race to the best of my abilities.” Levi finished first in the race, and was named to the Games team alongside Vancouver skier Annika Richardson. 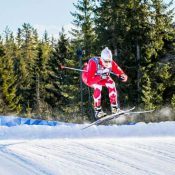 In February 2016, Levi travelled to Lillehammer, Norway, to represent Canada at the Youth Olympic Games. 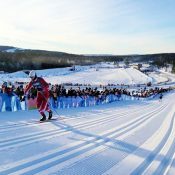 His most memorable moment was travelling by bus to a nearby town with two other Nordic teams, and skiing the 30km over a pass back to the city of Lillehammer, Norway, where the games were being hosted. Levi found the Youth Olympic Games experience not only enjoyable but valuable, and is now using his international racing experience as a stepping stone to achieving his dream of one day making the Canadian National Team. Levi is one of fourteen skiers who have recently been named to the National Development Centre (NDC) – Thunder Bay team. The centre targets the nation’s top prospective skiers, and works at developing the next generation of Canadian Olympians. Outside of his National Team dreams, Levi loves being outdoors – paddling, trail running, canoeing and more – and hopes to one day paddle the Nahanni River. 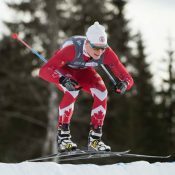 CBC NEWS MANITOBA (Dec 16) Levi Nadlersmith of Boissevain, Manitoba qualifies at cross-country ski event in B.C.